Original recipe calls for 2 cans of beer and 2 Tbsp of brown sugar. I definitely wanted to eliminate both to keep this lower carb. Poke the brats with a knife several times. This will help prevent them from bursting while cooking. Put all ingredients in a saucepan, and bring to boiling. Immediately reduce the heat and simmer for 15 minutes. Drain off the liquid. 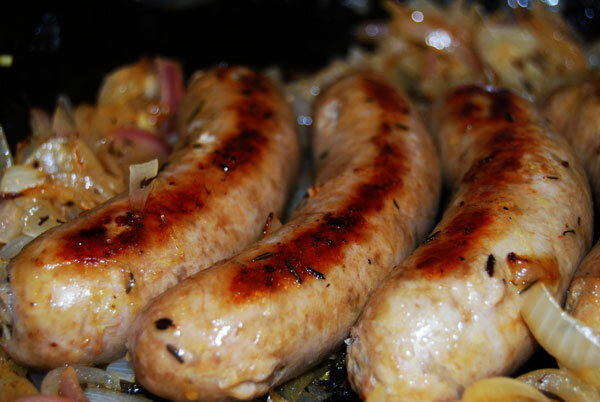 Heat olive oil in a frying pan, add brats and onions. Cook on medium until nicely browned, approximately 5 minutes per side. The brats can also be done on the grill.